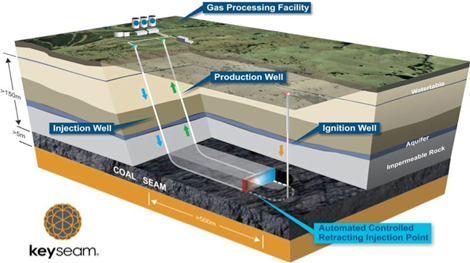 How it works: �Carbon Energy’s diagram of deep coal gasification. The company behind the proposal, Carbon Energy Ltd, has been forced into receivership, following its failure to raise $1.5 mln funding through a share purchase plan. The company’s shares have been suspended indefinitely on the stock exchange since Wednesday 28 November, when Korda Mentha were appoined voluntary administrators. �Less than a week later, the Sydney accountancy firm William Buck were appointed reeeivers and managers. Carbon Energy’s CEO, Bryan O’Donnell, told the AIR in November:�“ I do absolutely believe there is a case for deep coal to produce hydrogen in the Cooper Basin. “I have no doubt that in ten years’ time the production of hydrogen from coal will be quite significant, with CO2 capture and storage,” he said. Carbon Energy, now a Chinese-controlled company using “keyseam” technology based on CSIRO research, was seeking just $1.5 mln. The company’s key �plan was – and still is – to gasify coal underground, at least 1,500 metres below the �surface, to produce up to 68.6 per cent hydrogen. The company had hoped to begin exploration drilling in the second and third quarters of this year. �The aim was to begin commercial production as early as 2020, scaling up to full scale commercial production in 2030.� In theory, the coal in the basin could produce up to 20 mln tonnes of hydrogen a year for more than 50 years. O’Donnell said he had hoped that the share purchase plan would broaden the shareholder base and bring in some signficant long term investors, but the Chinese interests, who control 80 per cent of the company, did not support it. There was also very little support from shareholders holding the remaining 20 per cent.� The offer, of up to $15,000 worth of shares at eight cents each, was extended three times, but raised less than $281,000. “If things work out according to my plan, one thing in the future will be a share purchase plan that will be successful,” O’Donnell said. O’Donnell, who has a background in major projects in the oil and gas industry, was brought in in January last year �to turn the company around. “I have a pretty strong belief that the massive consumption of petrocarbons and the emissions of CO2 is. ... putting the environment in a very precarious position. He said that although major gas companies such as Woodside were committed to sequestering their carbon dioxide, little was actually being done because it was a direct hit to their profits.� He did not think that that would change until there was a price on carbon. Carbon Energy operated �an underground coal gasification (UCG) trial �using keyseam at Bloodwood in Queensland from 2010 until 2016, when the Queensland Government banned all UCG in response to the environmental disaster caused by Linc Energy's coal-to-diesel operation near Chinchilla. Carbon Energy, however, maintains that its keyseam system produced a more consistent quality and composition of syngas than traditional UCG, and can be adjusted to produce commercial quantities of hydrogen at competitive prices. �It was given a clean bill of health by the Queensland government’s �independent scientific committee, but approval of any form of underground coal gasification had become politically unacceptable. The Queensland ban on UCG pushed Carbon Energy to the wall, but it was rescued by Chinese investors hoping to use its technology in Chinese coalfields.� It is understood, however, that the initial Chinese proposals have since run into difficulty, with a joint venture partner pulling out. Carbon Energy maintains that it proved its keyseam system produced a more consistent quality and composition of syngas than traditional UCG, and can be adjusted to produce commercial quantities of hydrogen at competitive prices. Disclaimer: The author owns shares in Carbon Energy (and has the losses to prove it).